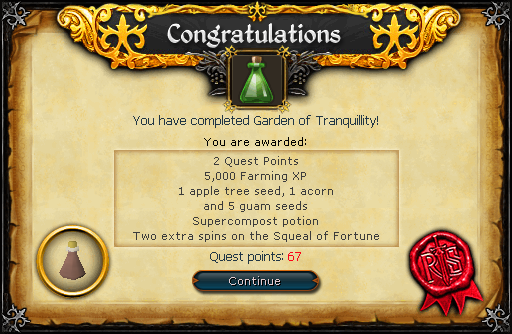 Head to Draynor Village (use a Glory Amulet or lodestone teleport) and talk to the Wise Old Man. He will tell you to get a Ring Of Charos. You should have gotten one after completing the Creature of Fenkenstrain Quest, but if you lost it you can pickpocket Fenkenstrain to get another. The old man will check that you are a good Diplomat by asking you 7 questions. Note: Although the questions and answers are always the same, the order in which the answers are displayed are random. So, sometimes "A" will be "B." Question: Two goblins are fighting over the colour of their armour. What do you do? Answer: Show them a range of colours so that they can come to a compromise. 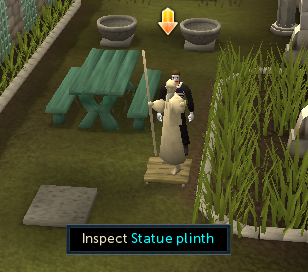 Question: A drunken dwarf offers you a kebab. What do you do? Answer: Take his generous gift even though you have no need for it. Question: Are you enjoying your experience of Farming? Answer: It's absolutely, unquestionably the most interesting thing I've ever done! Question: A dwarf asks you to put on a silly golden helmet so that you can be fired from a cannon into a wall. What do you do? Answer: Put on the silly helmet and jump into the cannon. Question: You meet Pkmaster0036 in the wilderness who asks you who is the greatest player killer in the world. How do you answer? Answer: I am, prepare to meet your doom Pkmaster0036! Question: Queen Ellamaria orders you to go on a foolish quest without any offer of a reward. What do you say? Answer: Ask me nicely and I might consider it. Question: A draynor bank guard asks you if you've seen any suspicious characters lately, because the bank has been robbed. What do you say? Answer: No, especially not that wise old man, who doesn't look at all suspicious. Lodestone teleport to Taverly and talk to Bernald in the garden of the Pick and Lute pub in southwestern Taverly. Charm him with the ring when necessary. Now use a Plant Cure on the vine. You will receive the message that nothing happens. Talk to Bernald again and he'll recommend you talk to Alain. 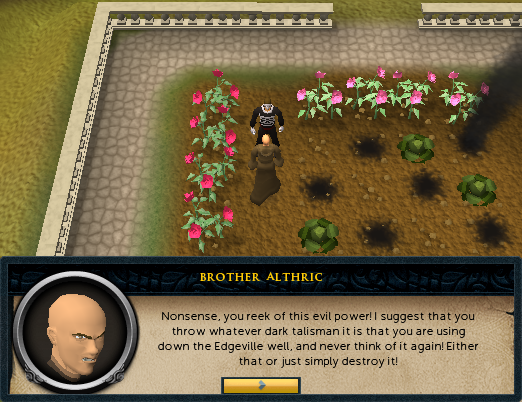 Try to take the seeds out of one of the roses from the Monastery, and a monk will stop you. He will tell you to destroy the dark object. Instead of destroying it, head over to Edgeville and throw it down the Well. Now try again and he'll tell you that you may take the seeds. Take seeds out of each of the colored Rosebushes to get some Pink, Red and White seeds. 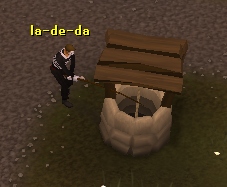 Now to retrieve your Ring of Charos (a) from the well, simply use a Fishing Rod with the Edgeville Well. Now go to the farm in Catherby and speak to Dantaera, and use the ring's charm on her. She will tell you that there is one last white tree on Ice Mountain. 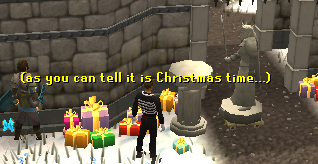 Make your way to Ice Mountain, either by walking from Catherby, using the Falador lodestone teleport, or using the Edgeville lodestone teleport and walking from there. 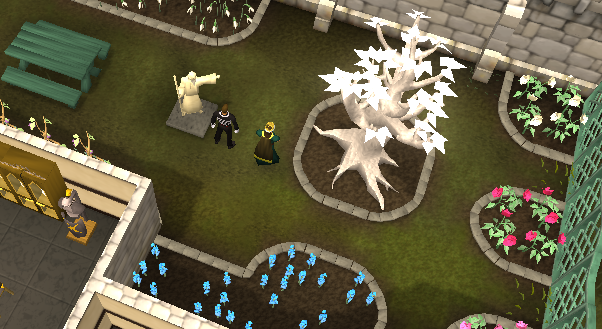 Near the Oracle from the Dragon Slayer Quest Quest, there will be a white tree. 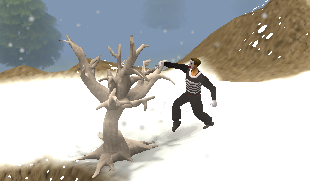 Click on the tree and use the secateur option to obtain the white tree shoot. Bank any unneeded items (such as teleport runes, empty vials, etc.) and head to the Queen. Use a bucket of Compost with each of the orchid pots and plant all the seeds in their respective patches (rake them first). The patches do not require any compost or watering.